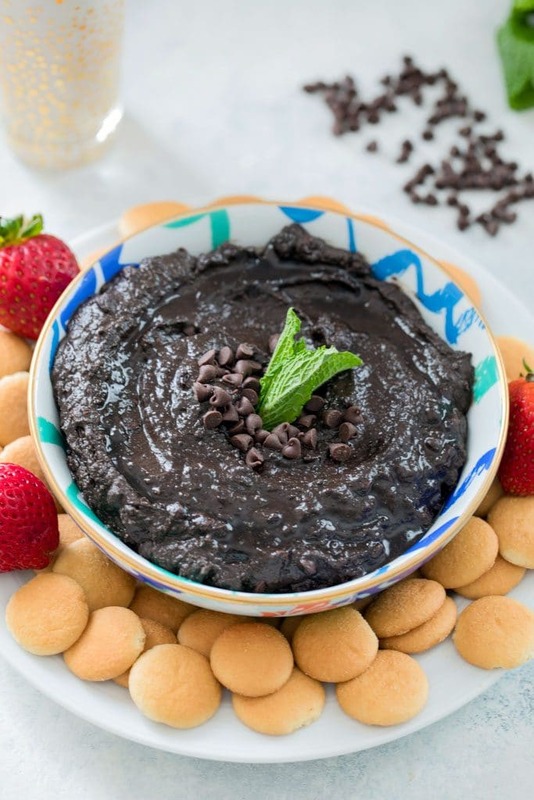 This Mint Chocolate Hummus can be served with fresh fruit or cookies and makes the perfect creamy dessert dip. Nobody will even guess that it’s made with chickpeas! Have you guys gotten sucked into the chocolate hummus craze yet? omg I am so here for it. I admit, I was pretty bothered by it at first… Like, why would I want my hummus, a food that’s meant to be savory, to be served as a dessert? Why would I want my chocolate to be mixed with chickpeas? Why why why??? Well, I can now tell you exactly why. Because it’s freaking DELICIOUS; that’s why. It took a little while from when I first saw chocolate hummus on my grocery store shelves until I built up the courage to try it, but once I did, I fell immediately in love. It’s chocolatey and creamy and basically just a delightful dessert spread that you won’t be able to stop eating. You can’t even taste the chickpeas and wouldn’t think there’s anything weird about it. I wasn’t quite sure how making my own would turn out and figured those crazy hummus people must have some secret trick to make this stuff taste so amazing. But after a little experimenting in the kitchen, I realized it’s incredibly simple to make at home. And now I have the perfect party dessert dip recipe to share with you. Hooray! This recipe is only eight ingredients (aside from the dippers!) including chickpeas, dark cocoa powder, coconut milk (or dairy/nondairy alternative of your choice), agave (or honey) mint extract, fresh mint, salt, and mini chocolate chips. You could even leave the fresh mint out if you don’t have any, but I wanted a little extra minty kick. And all you need to do is put the first seven ingredients (just half the milk) in a food processor, adding the milk until you get your desired consistency. I like a super creamy hummus, so I used the full 1/2 cup coconut milk. Then you fold in the mini chocolate chips and put the whole shebang in a serving bowl. And set it out with your favorite dippers. I absolutely loved the mint chocolate hummus with mini Nilla Wafers (hello! how did I not know those minis existed?? ), but it’s also pretty ridiculous (that’s ridiculous in a good way) with strawberries, apples, and all kinds of fresh fruit. Basically, I want to dive into this bowl and live in a pool of mint chocolate hummus. But wait! If you don’t like the mint chocolate combo (I loveeee it, but sadly know quite a few people who don’t), you can simply omit the milk extract and fresh mint leaves and make this a straight up dark chocolate hummus. There are a million other chocolate hummus flavors you could make, too, including coconut, peanut butter, hazelnut, strawberry, marshmallow, etc. You better believe there is more chocolate hummus in my future. I also have a really delicious recipe for Cranberry Hummus on my blog and it’s kind of like the perfect mix of savory/sweet hummus. 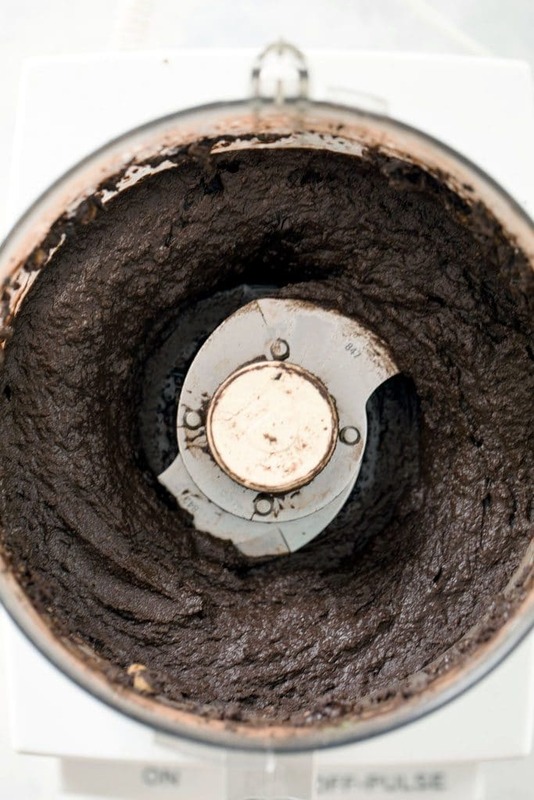 It could be a good stepping stone dip for you if you’re scared to try dessert hummus! I went back and forth on whether or not chocolate hummus should involve tahini, but after looking at the ingredients on a few different chocolate hummus packages, it seemed like none of them had it. But wouldn’t you know, I just noticed that my grocery store now carries a chocolate tahini. I might need to try another version with that… But then again, why mess with perfect?? This is such a fun dessert to serve at a party. But I kind of recommend just setting it out as a “chocolate dessert dip” and letting people indulge. And then when the bowl is basically empty, yell out, “surprise! you just ate chocolate hummus!” Not that I believe in deceiving your party guests, but I feel like some people might be a little weirded out by the idea of a chocolate dip involving chickpeas. But once they take a bite, they’ll fall in love. You definitely can’t taste the chickpeas and there’s nothing hummus-y about this chocolate dip. It’s just plain deliciousness. I’m not going to go so far as to start proclaiming this is a healthy dessert because it obviously has cocoa powder, sweetener, and mini chocolate chips in it (also I served it with cookies LOL), but it’s definitely healthier than most other dessert dips. Plus, the chickpeas are packed with protein and fiber, so this is one dessert that will likely fill you up and satisfy you more than others. Now that dessert hummus is a thing, what could possibly be next?? I’m all about any new ways I can pack nutrition into my desserts, especially when those desserts involve chocolate. And bowls that I can sit on the couch with while I watch bad reality TV and indulge. Bring. It. On. We live in a crazy time, my friends, and I’m just so happy I’m here to experience it. Have you tried chocolate hummus yet? There's no reason to be skeptical of chocolate hummus! 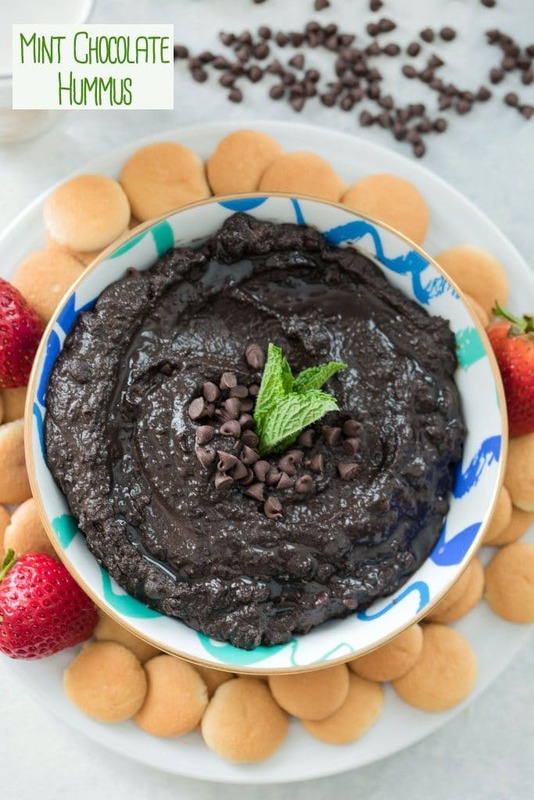 This Mint Chocolate Hummus can be served with fresh fruit or cookies and makes the perfect creamy dessert dip. Nobody will even guess that it's made with chickpeas! Put chickpeas, cocoa powder, 1/4 cup coconut milk, agave mint extract, chopped mint, and salt in a food processor and blend until creamy. 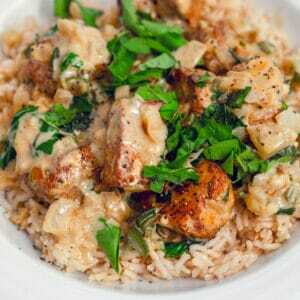 Slowly add in and blend remaining 1/4 cup coconut milk until desired consistency is reached. Fold mini chocolate chips into the hummus and move to a serving bowl. Top with additional mini chocolate chips and mint leaves. 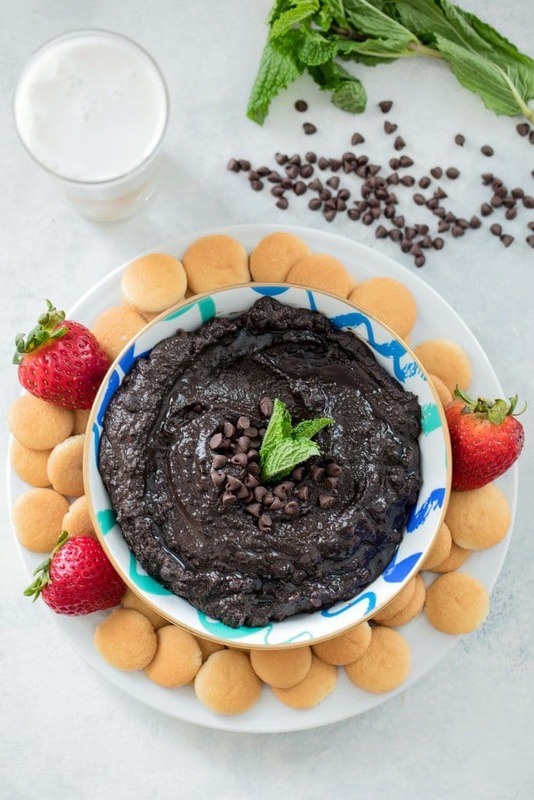 Serve mint chocolate hummus with Nilla Wafers, fresh fruit, animal crackers, or whatever you choose! If hummus isn't sweet enough for you, feel free to stir in more agave or honey, 1 Tbsp at a time. If you don't have fresh mint, you can omit it. 21 Responses to "Mint Chocolate Hummus"
I haven’t gotten on the bandwagon yet but this looks too good to resist. I don’t believe I’d have any left in the bowl with my family. 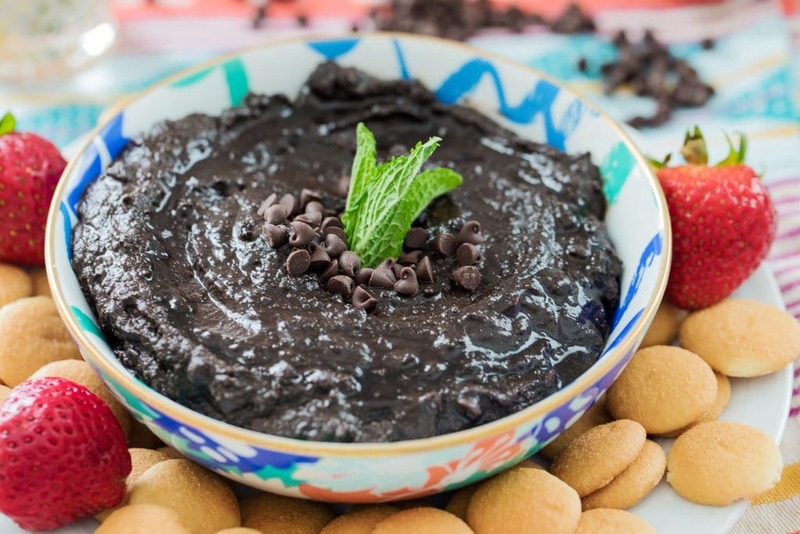 Let’s hear it for chocolate hummus. YAY!! OMG! I love this! Dessert hummus is so good. Love the mint. It feels like you’re cheating on a diet, but you’re not! I’ve never tried dessert hummus – I’m so excited to! I’m frightened of this mint chocolate hummus! Seriously. Because when I make it, I’m afraid I’m going to eat the whole thing myself. That’s how delicious it looks! I think I’ll make it for the Memorial day party I’m going to so I don’t do what I fear. I haven’t tried it yet! But I’ll try anything once at least. I am sure I will be happily surprised. Hmmm….now this is a very interesting combination. I would never have paired chocolate with chickpeas. I can see this being totally addictive….but since it has chickpeas….might as well enjoy it by the spoonful!! I eat hummus like that sometimes LOL. I would have never thought of this combination but it sounds like a great dip idea! 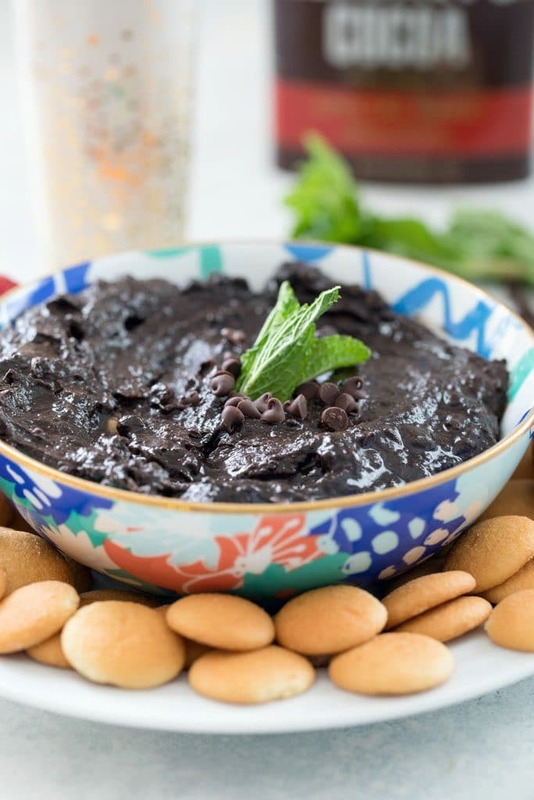 Love chocolate so I cannot wait to try this hummus dip, Delicious and good for you! Yes, please! This is the first I’ve heard of chocolate hummus. What an sweet twist on a savory tradition. It looks rich and chocolatey and I bet you don’t even taste the chick peas. How did I not know this was a thing? It sounds terrific and Im going to try it for a girls card night Im having this week! I cant wait to see if anyone figures out here are beans in it! Wow! This is such a clever idea. I am going to try it for my next house party. Okay, so I’ll probably have to taste this to be really convinced.. but it makes every bit as much sense as those black bean brownies. And those are stinkin’ delicious! So I would totally try this.. and actually, I might do it this week! 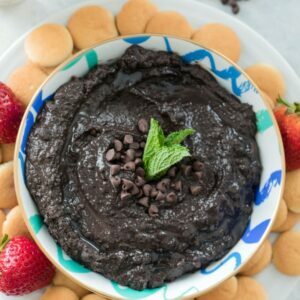 I’ve never heard of chocolate hummus until now!! I haven’t jumped on the dessert hummus bandwagon just yet but it’s been on my to try list for a while. I like your version with mint for a nice refreshing kick and I bet it would be great for Christmas also when it’s all about peperminty mint and chocolate flavours! I’m totally game for chocolate hummus, but I’d definitely take your advice and NOT tell anyone at the party until they’ve eaten it. 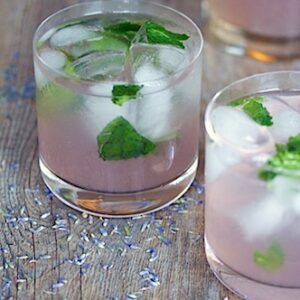 Agave nectar is a nice choice of sweetener. Healthy desserts for the win! Oh I have notag gotten on the dessert hummus train yet and I’ve been SO against it until now. 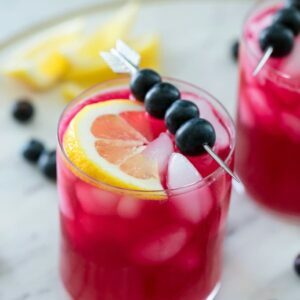 This recipe is SO good. You’ve made me a believer!!! Okay, I honestly didn’t even know chocolate hummus was a thing! But I’m game to try it! It makes sense if you have ever tried black bean brownies! I am here for the dessert hummus trend and need to have them ALL. I haven’t tried making mint chocolate yet but I think it’ll have to be next on my list. I can’t wait to use this recipe! How did I not even know this craze was a thing? 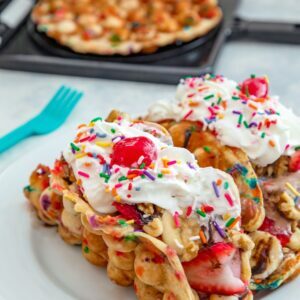 This is right up my alley and I am soooo excited to try it out when I get back from vacation! Admittedly, I’m behind the times on the whole chocolate hummus thing. My wife informs me that they’re all the rage. Sounds like a good idea to me. After all, I’ve been enjoying baking brownies (etc.) 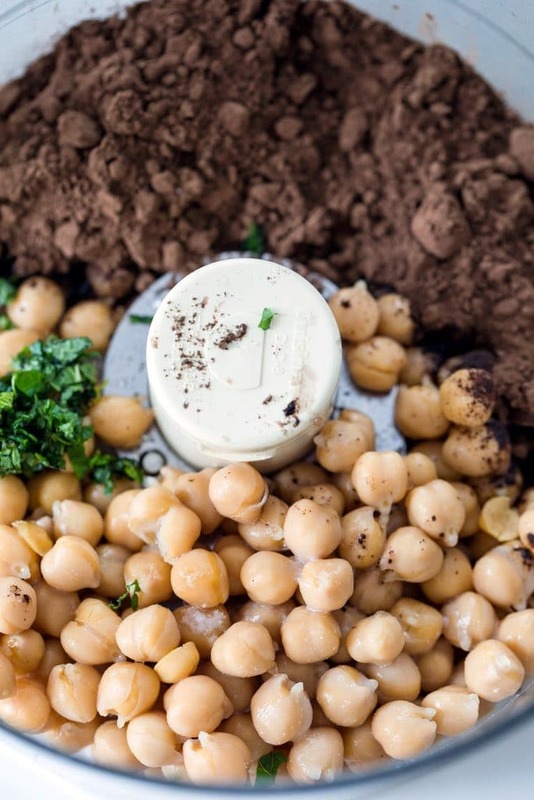 with chickpeas and beans for years now… hummus sounds every bit as good and even easier! I’m tempted to try this as a sort of icing for cupcakes!